With the new release of Sage 500 ERP 2013, Sage has added a new Visual Process Flows that allows you to increase productivity by streamlining all your tasks. There are seven predefined process flows that are available in this new release, including: Entry and Invoice, Pack and Ship, Return Goods, Invoice and Receive Payment, Physical Count, Entry and Receipts, and Invoice and Process Payment. Due to this new enhancement, it is now even more important to keep your EDI solution current and up-to-date. MAPADOC has been updated and is now available for Sage 500 ERP 2013. Just as in the Sage 100 ERP MAPADOC update, MAPADOC for Sage 500 ERP has an additional three predefined process flows that will improve the overall usability and productivity of your EDI solution. The EDI Orders visual process flow is an interactive workflow diagram that shows the steps to complete the processing of your inbound EDI purchase orders. All of the MAPADOC tasks to process purchase orders are shown as well as links to Enter Sales Orders and Print/Acknowledge Sales Orders. 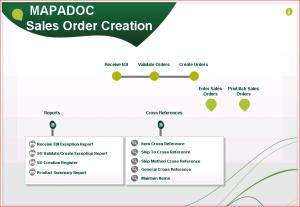 This visual process flow also contains links to all of the reports related to incoming purchase orders and links to the MAPADOC cross-reference setup tasks that may be needed during processing. The EDI Invoices visual process flow is an interactive workflow diagram that shows the steps to complete for sending outbound EDI invoices. All of the MAPADOC tasks to process invoices are shown as well as links to View/Edit Invoices and View/Edit MAPADOC UDFs. This visual process flow also contains links to all of the reports related to outgoing invoices and links to the MAPADOC cross reference setup tasks that may be needed during processing. The EDI ASNs visual process flow is an interactive workflow diagram that shows the steps to complete for capturing ASN packaging information, printing labels, and sending outbound EDI advanced ship notices (ASNs). All of the MAPADOC tasks to process labels and ASNs are shown as well as links to Edit Shipments, View/Edit MAPADOC UDFs, and ASN History. This visual process flow also contains links to all of the reports related to outgoing ASNs and links to the MAPADOC cross-reference setup tasks that may be needed during processing. MAPADOC is an EDI solution that will help manage your EDI requirements when using Sage 100 ERP, Sage 500 ERP, and Sage ERP X3. For more information on our MAPADOC EDI solution, Schedule a Demo, or inquire about our MAPADOC Partner Program please contact Hellene Thurston at (973) 758-6137 or at hellene.thurston@swktech.com.